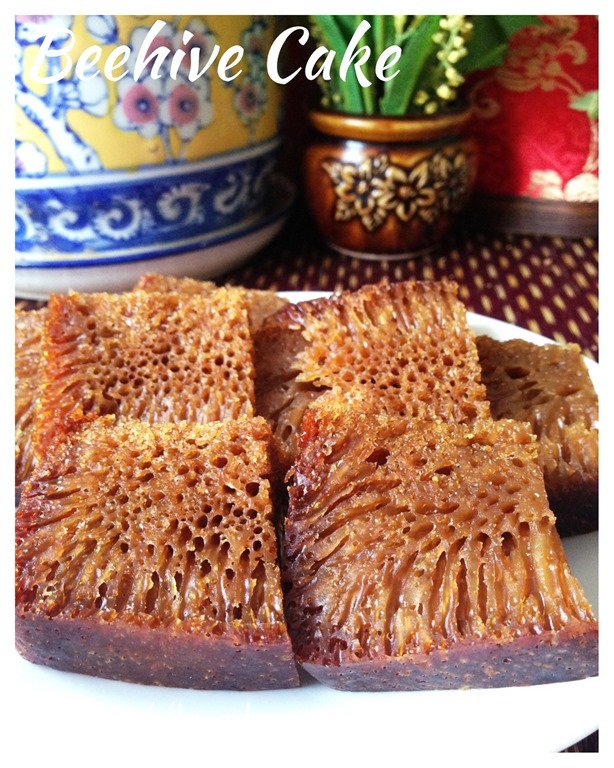 I intended to update this post in the old post but somehow due to technical difficulties, I can’t retrieve the old post for updating and you will have to refer to this post : My Childhood Cake–Bee Hive Cake/Malaysian Honey Comb Cake or Kueh Sarang Semut (蜂巢蛋糕）for the illustrations and basic recipes. 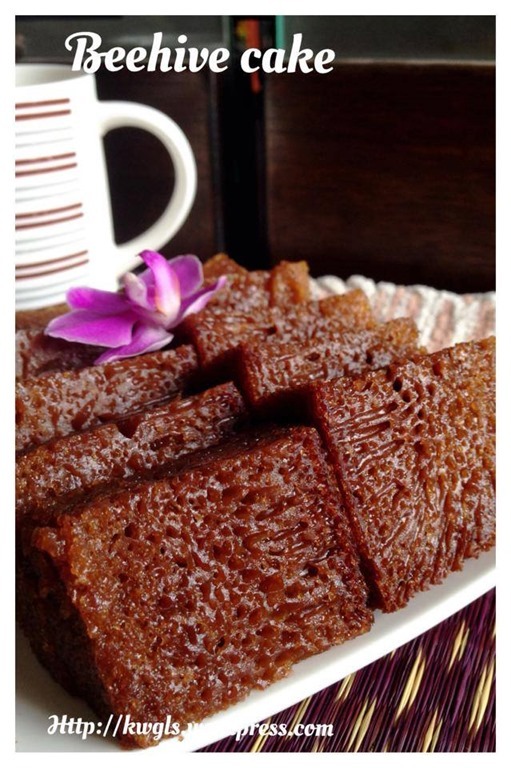 There are 2 recipes in that particular post : the normal caramelization of sugar approach and the use of golden syrup approach. 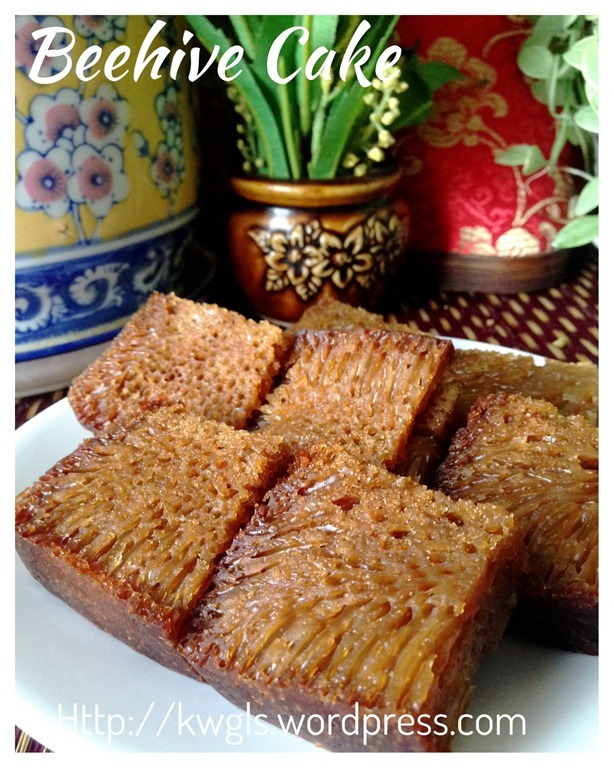 This updated post will share the third recipe using brown sugar and the method of preparation will be much faster and easier. No pictures of illustration will be shared in this post. 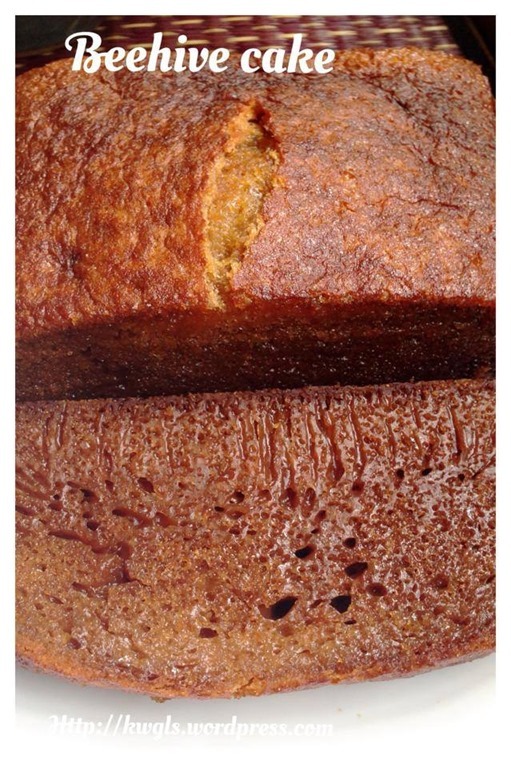 The pictures are from my third bake about half a year ago and today’s bake. 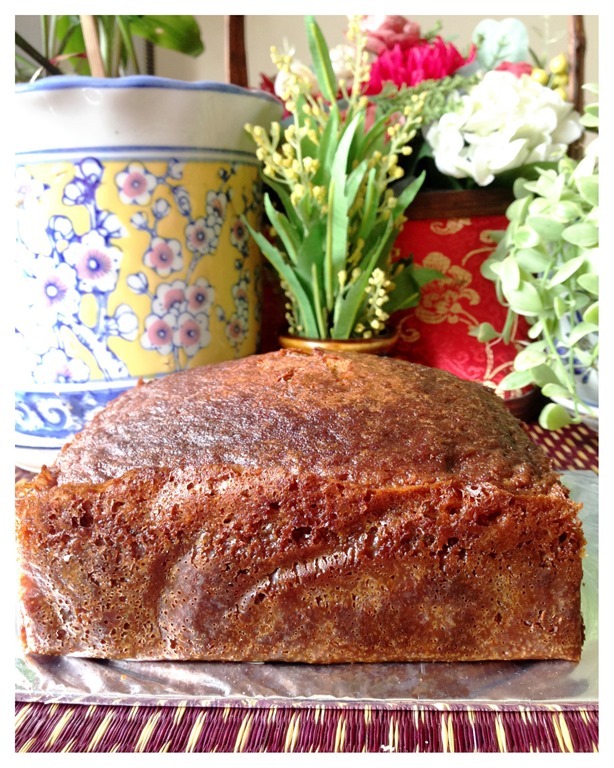 Grease a 6” or 7” square baking tin with melted butter or cooking oil. In a pot, add brown sugar, butter, condensed milk and water. Heat until all the sugar have dissolved. 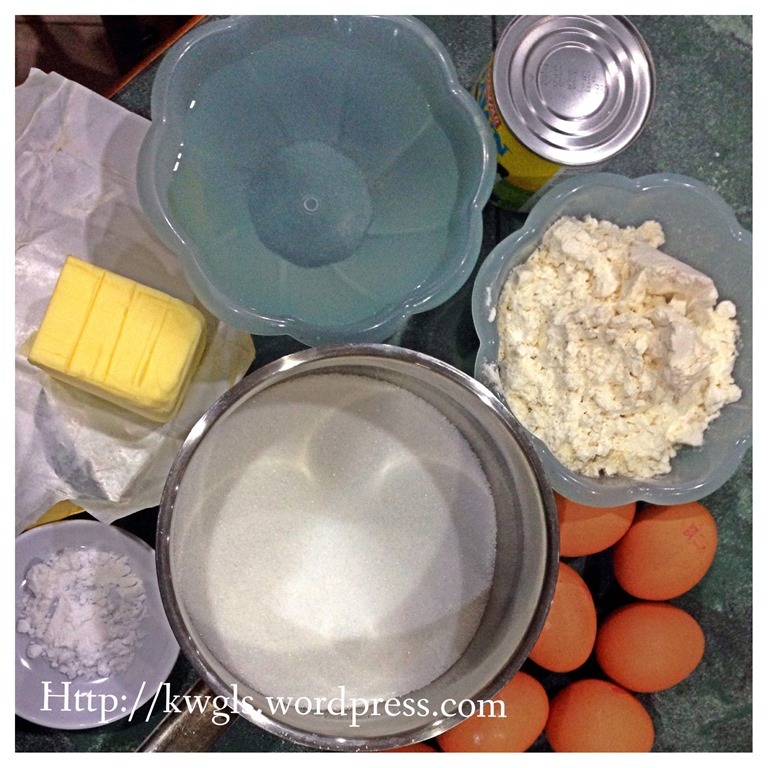 In a whisking bowl of a standing mixer, put flour and the butter sugar liquid mixture and add eggs one by one. Whisk until well mixed. If there are some lumps, sift the mixture into the greased baking tin. Sift in the baking soda, quickly stir before putting in the oven. Baked in the pre-heated oven of 160 degree Celsius bottom heat for 20 minutes. After 20 minutes, adjust the heat to “top and bottom”, bake for an additional 15 minutes or until a skewer comes out clean. Cut only when completely cooled. 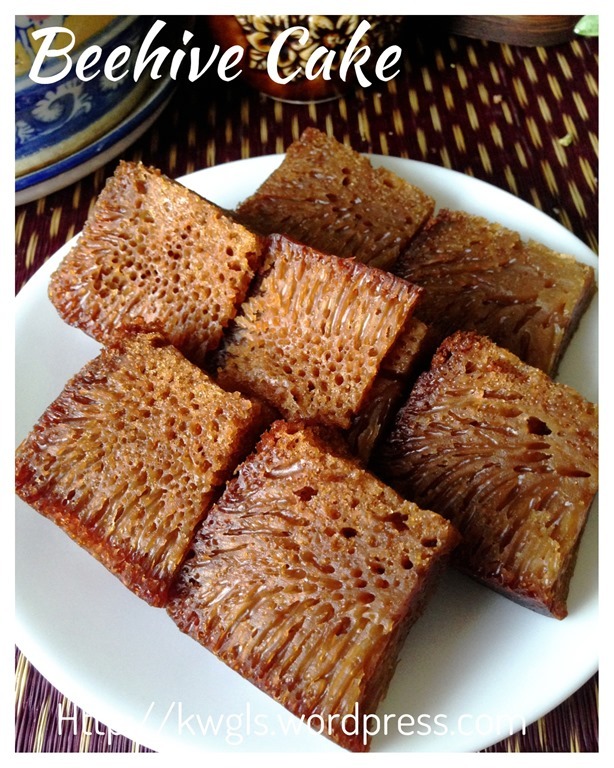 Remember that this post is part and parcel of the older post : My Childhood Cake–Bee Hive Cake/Malaysian Honey Comb Cake or Kueh Sarang Semut (蜂巢蛋糕）. 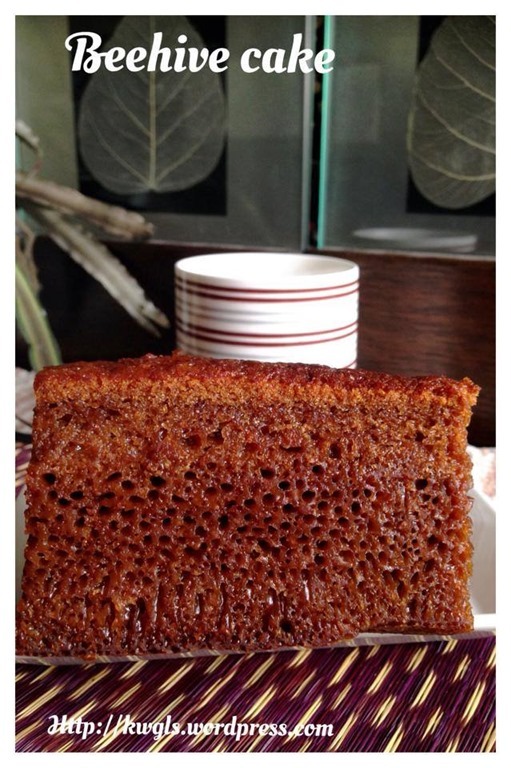 This is the newer approach and if you asked me my preference, I will still prepare the caramelization of sugar. However, as time is precious, I do not mind the brown sugar approach or the golden syrup approach. 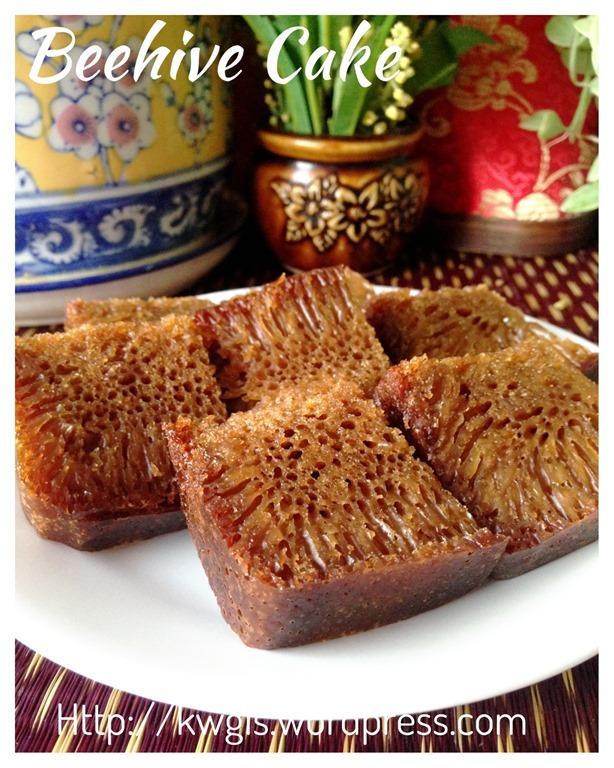 This entry was posted in Chinese and Asian Cakes and Snacks, Food Preparation Series and tagged 8, beehive cake, 蜂窝蛋糕， honeycomb cake, GUAI SHU SHU, Guaishushu, kek sarang lebah, kek sarang semut, kenneth goh, postaday. Bookmark the permalink. 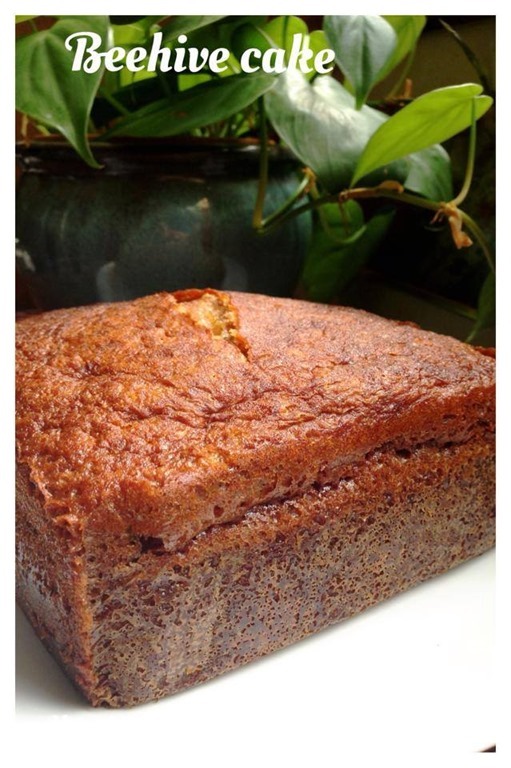 I have been following your recipes and your recipes are great and very detail. I always have this question- where should we put the tray when baking cake/cookie/pizza, is it at the middle rack or lower rack in oven.? Is it possible to include this infor in your recipes? In general, all the baking shall be done at the lower rack unless specifically mentioned. 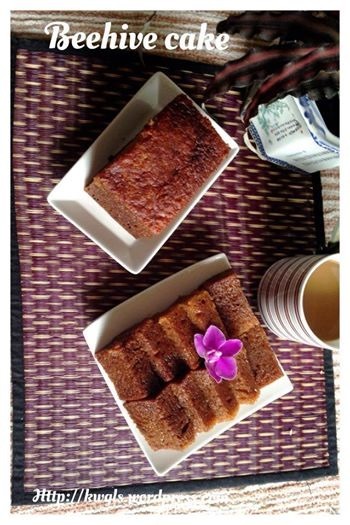 May I know what type of brown sugar did you use ? It can be any type of brown sugar. The purpose is for colouring. I see the recipe need 1.5 tsp of baking soda. will it make the cake taste bitter? It wouldn’t.. I did not feel that it is bitter as it is a rather big cake. 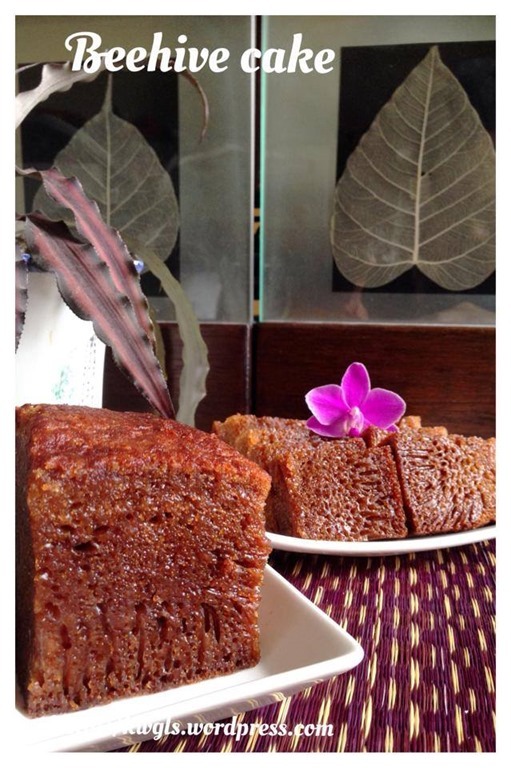 Can I use the same recipe minus out the brown sugar replace white sugar? 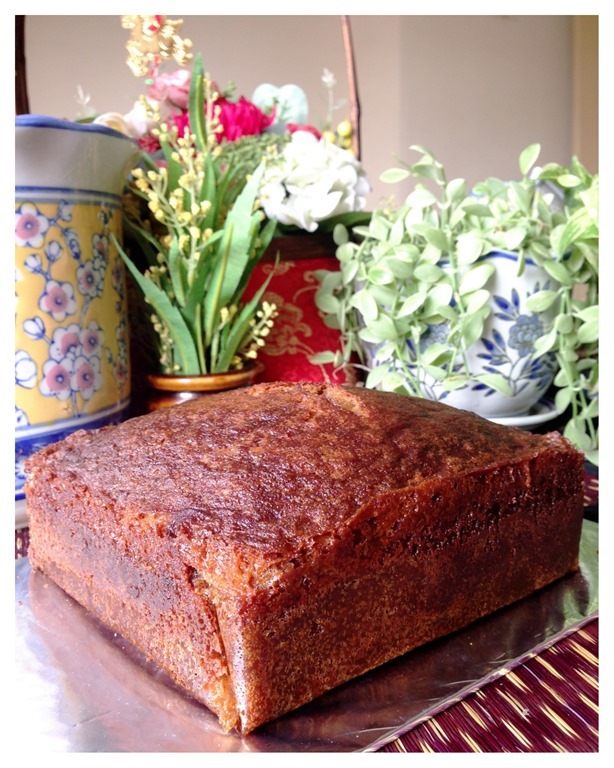 Then I caramalise n use the method of steaming to do up the cake.I saw my Malay FREN steam this cake n turn out nice too.TQ if u can reply me. Yes, you can caramelize white sugar. That is the traditional method of doing so. As for the Pinterest, you can PM me https://www.facebook.com/kengls your pinterest registration e-mail. How much is the 1/2 can sweetened creamer beverage substitute for condensed milk in terms of cups or mil? Need help to convert to grams. Thank you. Hi Kenneth if my oven doesn’t have a top/bottom heat do I just bake them at one go at 160deg for 35 mins?